Everyone loves this Lone Wolf. Fractional Proof Set, with a mintage limit of just 7,500! 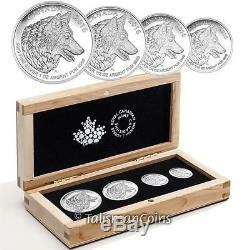 How awesome is this - a 4-Coin Proof Set tribute to the Grey Wolf? Why can't the United States Mint come up with something this patriotic and desirable to say nothing of rare - the total mintage limit is only 7,500! 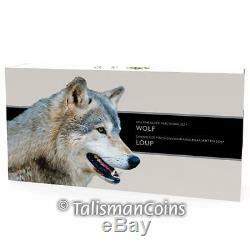 Designed by Canadian wildlife artist Pierre Leduc, each of the four beauties in this fractional proof set depicts a profile portrait of the noble Grey Wolf. The apex predator that gives us the term "lone wolf". Minted in the purest silver. On the planet, the four coins are: 2 Dollars - 1/10 Troy Ounce Pure Silver 3 Dollars - 1/4 Troy Ounce Pure Silver 4 Dollars - 1/2 Troy Ounce Pure Silver 5 Dollars - 1 Troy Ounce Pure Silver We know this set will be popular, so here's an exclusive opportunity for the savvy investor! A word to the wise - get this one while the gettin's still good! 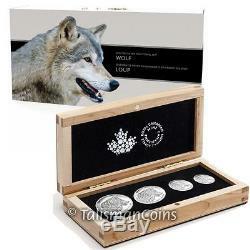 Pure Silver Lone Wolf 4-Coin Fractional Pure Silver Proof Set - Mintage 7,500. 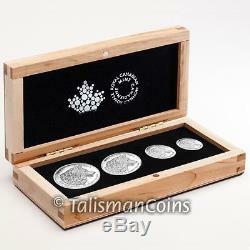 Don't miss out on these other great Canadian Silver Sets! 2012 Farewell to the Penny Pure Silver 5-Coin Set. 2013 25th Anniversary of the SML 5-Coin Fractional Set. 2014 24-Karat Gold-Plated 5-Coin Fractional SML Set. 2014 Bald Eagle - Day in the Life 3-Coin Pure Silver Proof Set. 2014 Majestic Maple 3-Coin Pure Silver Proof Set with Jade. 2015 Red Enamel Incuse Silver Maple 5-Coin Fractional Set. 2015 Looney Tunes Complete 4-Coin Collection Proof Set. An Original Work of Art. The design, created by Canadian wildlife. Artist Pierre Leduc, is an original work of art. Using different finishes to enhance the expert engraving, Royal Canadian Mint engravers have faithfully rendered a lone grey wolf in exceptionally fine detail. This right-side profile emphasizes the textures on the wolfs furry neck, its pointed ears, and its facial features. Possessing keen senses, the intelligent animal has fixed its steely, determined gaze upon something in the distance just beyond the reverse image field; this allows the viewer to get a close view of the wolfs. Expression as it stands with its tongue slightly protruding and its mouth open to reveal a row of teeth along its lower jaw. The overall design boasts a remarkable combination of artistry and craftsmanship as the wolfs meticulously engraved fur lends the image a sense of dimension and depth, in a way that the viewer can easily imagine the softness of it to the touch. These fractional silver coins are 99.99% pure! It's a true thrill to wildlife. Lovers when they catch a glimpse of the mythic wolf in the wild! Although they were held in high esteem for eons by Native Americans. Because of their spirits, wolves have been eradicated throughout most their range in North America, partly by hunters for trophies, and partly by ranchers as pests. However, wolves have been making a comeback recently and have been reintroduced to several locations, including national parks. Play an important role by preying on big game animals and helping to control their population, including eliminating aged and diseased animals. Though they hunt in packs, wolves do not view humans as prey. The largest member of the canine family, the Grey Wolf. Varies in color from grizzled gray or black to pure white. This animal tends to live, travel and hunt in a pack, which usually includes the alpha mother and father, their pups and several younger animals. Grey Wolves develop close relationships and strong social bonds. They often demonstrate deep affection for other members of their pack, and may even sacrifice themselves to protect the family unit! Ultra-low mintage, an unique wildlife design by an award-winning artist, cameo frosted proof finish, four pure silver fractional coins, all presented in an handsome, solid wood Canadian Maple presentation case. What more do we have to say? Artist Pierre Leduc, is an original work of art, a profile portrait of a lone grey wolf. The legend 9999 FINE SILVER guarantees the purity, while the weight of each coin in troy ounces of pure silver is also indicated. Her Majesty, Queen Elizabeth II. This portrait, the fourth effigy of the queen to appear on Canadian Coinage, was executed by the artist Susanna Blunt. The legend ELIZABETH II D. REGINA ("Elizabeth II, Queen by the Grace of God") also appears. The date and denomination are also indicated. The coins are encapsulated inside a handsome solid wood, Canadian Maple presentation case, lined with black velvet. An individually-numbered certificate of authenticity is included. The item "Canada 2016 Lone Wolf 4 Coin Fractional Pure Silver Proof Set in Maple Wood Box" is in sale since Wednesday, November 04, 2015. This item is in the category "Coins & Paper Money\Coins\ Canada\Commemorative". The seller is "talismancoins" and is located in Saint Louis, Missouri.